It’s worth mentioning that when I came across the chart in Monday’s post, I wasn’t just idly sifting through charts; I do have a life. Rather, I wanted to check to make sure my understanding of the history of the national debt was right. 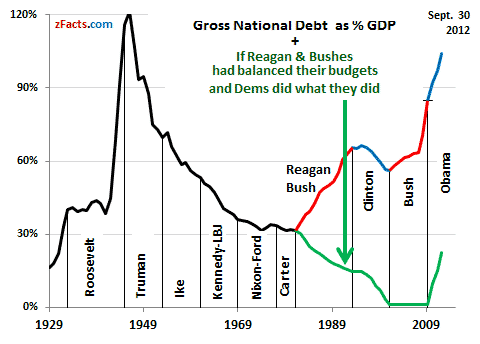 When Ronald Reagan took office, the burden of debt was low; it had been falling since the end of World War 2. Bush II drove it back up again, and left us with a persistent depression that has kept its burden increasing. So why did I even need to check that? It’s pretty freaking obvious, right? That’s technically correct, but it’s so far from the actual story that I had to go and make sure I wasn’t misremembering what actually happened. And no, I’m not quoting out of context: That passage contains everything the source says about the subject. I’m not trying to single that source out. It’s one example of a serious problem with almost all economics instruction (except, ahem, Economix): The idea that economics is somehow above partisan politics. There are a lot of problems with that. One, it’s misleading. Someone reading the above example would think that, aside from the pesky 2008 crash, everything was basically hunky-dory with our debt. Two, it’s dull. Dull, dull, dull. Seriously, read that example again. It turns an interesting story into a recitation of meaningless facts. Is it any wonder that most people find economics boring? But most of all, and the reason I wrote this post: it’s political. Avoiding politics will keep a textbook noncontroversial, the better to serve its tepid dishwater to more students, but when (to pull an example out of the air) certain politicians take out trillions in our name and leave us with nothing to even show for it, not mentioning this is not just highly political: It’s straight-up partisan. More partisan, even, than just giving the story straight. I understand why avoiding politics seemed like a good idea back in the day. But it hasn’t worked out as advertised, and it’s time to stop. Fortunately, economists are starting to wake up to the problem. But it will be a long time before that seeps down to the level of the typical econ 101 text. But hey, until then, there’s Economix! I’m a big fan of ‘Economix’ and I decided to use it this semester when teaching introductory microeconomics. Have you had conversations with anyone else about using it in teaching? I’ve been trying to think up things like quizzes, discussion questions, etc to motivate the students to read it and discuss it. Anyway, I just wanted to let you know that someone in academia is trying to use it and that any advice you have about talking about it or using the book in teaching, or using it to facilitate discussion would be appreciated. I couldn’t find any other contact details for you, so thought I’d just comment on the blog. (Assistant Professor of Economics, Smith College, 107 Pierce Hall, 21 West St, Northampton, MA, 01062). What’s so frustrating about these discussions is that people just want to talk about debt without talking about what it’s buying. No one would ever do this (especially not if we “ran the government like a business” like everyone pretends we should and no one sincerely believes). The Reagan debt was so toxic because it was all a gift to military contractors, arms manufacturers, banks, the ultra-rich, etc. When we’re talking about Bernie Sanders’ policies this year, the debt is used like it’s this crippling argument. But his policies would at least be investments. Maybe morons made us too broke in the past to afford it, but at the least we should have the discussion. Instead, we just talk about debt, budget deficits and surpluses, etc. without considering what’s going on. The Clinton era looked superficially healthy, but think about the long-term costs from the prison-industrial complex Clinton pushed through alone!